Fresh Basil Pesto is one of those commodities I just can’t do without, it makes this dish a lovely fresh summer option. 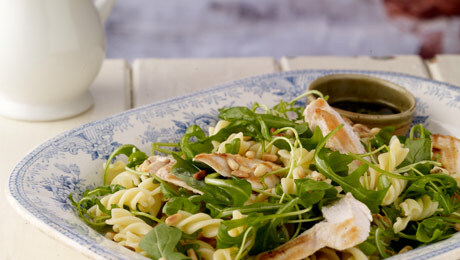 Perfect beside the BBQ too – add a splash to some mayonnaise for a fabulous flavour sensation. Brush the chicken fillets with a little oil and place on a preheated barbeque, cook until golden on all sides, this will take about 4 - 5 minutes on each side depending on thickness, ensure that the chicken is cooked through. When cooked remove from the barbecue and keep warm. Bring a large pan of salted water to the boil and cook the pasta according to packet instructions, strain and set aside.